Let SpotBot do the hard work removing a stain for you! 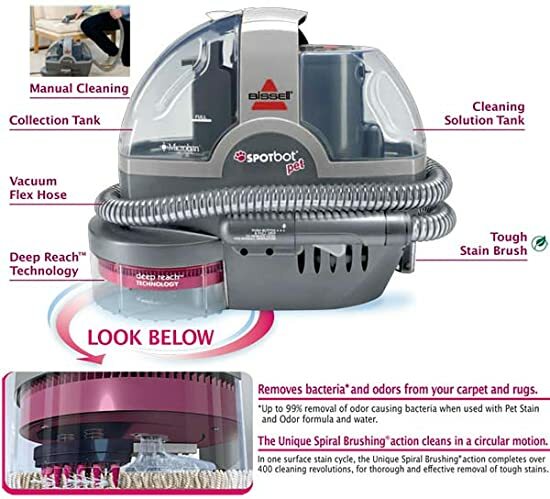 BISSELL SpotBot portable cleaner conveniently provides hands free spot cleaning. 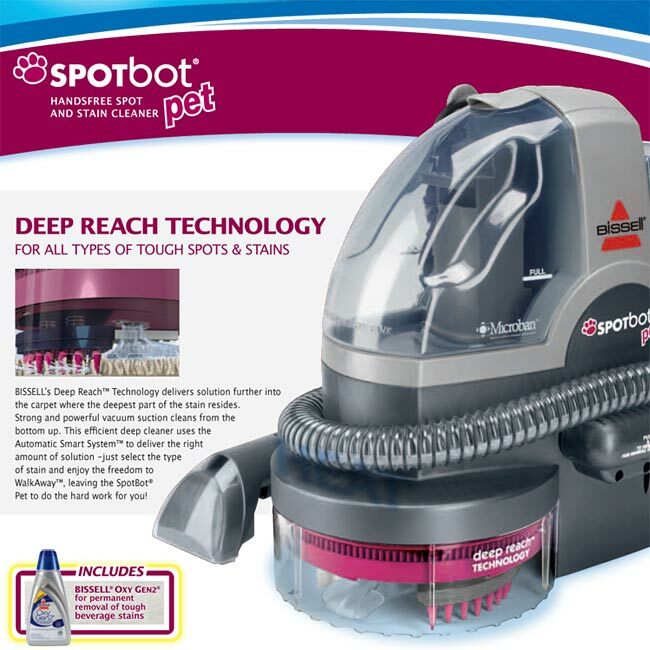 SpotBot does the work, simply select the type of stain and WalkAway™ while the preset cleaning cycles spray, brush and remove both surface and tough set-in stains at the push of a button! 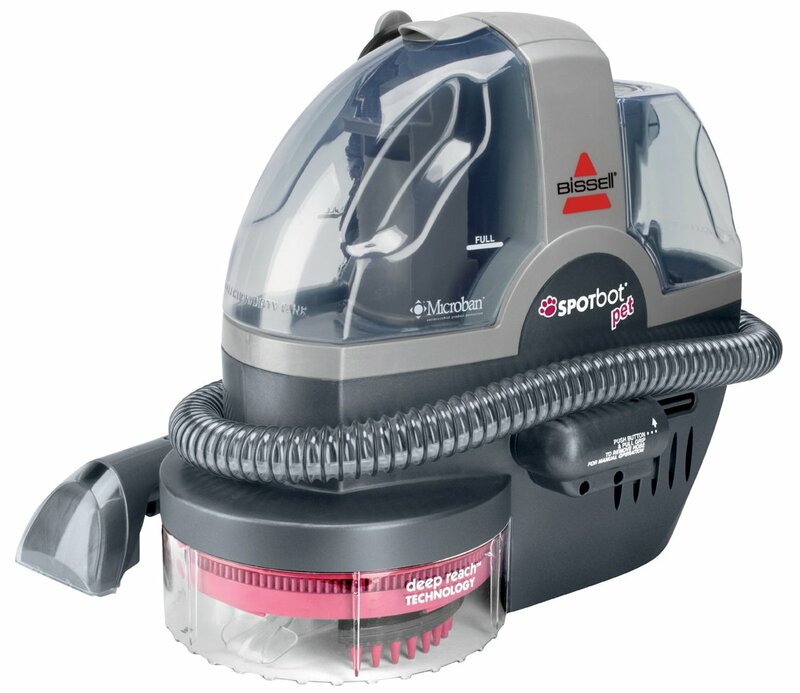 This efficient portable deep cleaner uses the Automatic Smart System™ to deliver just the right amount of portable machine cleaning formula for the type of stain being cleaned. In one surface stain cycle, the Unique Spiral Brushing® action completes over 400 cleaning revolutions, for thorough and effective removal of tough stains. SpotBot features unique Deep Reach Technology. This technology delivers solution further into the carpet where the deepest part of the stain resides for more effective cleaning from the bottom up! For everyday stains, use with BISSELL Little Green formula. For tough pet stains and odors, BISSELL Pet Stain and Odor portable machine formula helps remove odor causing bacteria frombacteria from carpet and rugs. Add BISSELL Oxy Gen2 formula along with either of these formulas for a boost in cleaning performance and permanent removal of tough stains. SpotBot is versatile and can be used for manual cleaning with a hose and tool stored on board for cleaning of spots and stains in hard to reach areas. Use it on carpet, upholstery, stairs and auto interiors. The SpotBot stores easily for cleaning up messes anytime and on the go.